"How come you're late?" asks the bartender as the blonde waitress walks in the door. "It was awful," she explains. "I was walking down the street and there was this terrible accident. A man was lying in the middle of the street; he was thrown from his car. His leg was broken, his skull was fractured, and there was blood everywhere. Thank God I took that first-aid course; all my training came back to me in a minute." When she arrives home, lights some candles, slips into something comfortable, and puts the tape into the VCR. To her disappointment, there's nothing but static on the screen, so she calls the video store to complain. "I just rented an adult movie from you and there's nothing on the tape but static." "Sorry about, that,"replied the store clerk. "We've had problems with some of those tapes. Which title did you rent?" What do you call a good-looking brunette guy in between two blond guys? An interpreter in need of an immediate rescue. If a blonde and a brunette are tossed off a building, who hits the ground first?v The brunette. The blonde has to stop to ask for directions. Or: The brunette. The blonde is such an airhead. Why did the blonde dye her hair brunette? She thought it would help her get a higher score on the SAT. A bleached blonde and a natural blonde were on top of the Empire State Building. How do you tell them apart? The bleached blonde would never throw bread to the helicopters. What did the blonde say when she knocked over a Ming vase? She gathers her clothes into a pile and jumps off. About two cans of hair spray. To catch as much as they can that goes over their heads. What happened to the suicide blonde? What can save a dying blond? Did you hear about the new form of birth control for blondes? They take off their makeup. What did the blonde say when someone blew in her bra? Why do blondes have square breasts? Because they forgot to take the tissues out of the box. 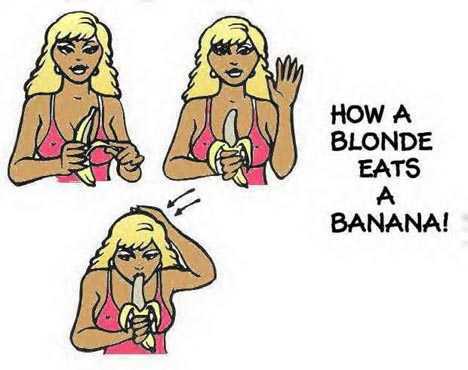 What do blondes eat to increase their breast size? How can you tell if a blond writes mysteries? Why didn't the blond want a window seat on the plane? He didn't want it the wind to mess up his hair. Did you hear about the new epidemic among blondes? It's called MAIDS - if they don't get one, they die.